We’re wishing now we had more time here, and had been less exhausted when we arrived – Perth is a wonderful city! We did not hit the ground running when we arrived in Perth. We did almost nothing for our first two days here, and not a whole lot on our third day either. Frankly, we were just worn out after our time in India and Hong Kong, and decided it was more important to rest and catch up on all the sleep we’d missed rather than get out every day. I slept over 11 hours the first two nights we were here – I was that tired. We were right to give ourselves six days here to pull ourselves back together. A nearby florist had native Australia blooms for sale. 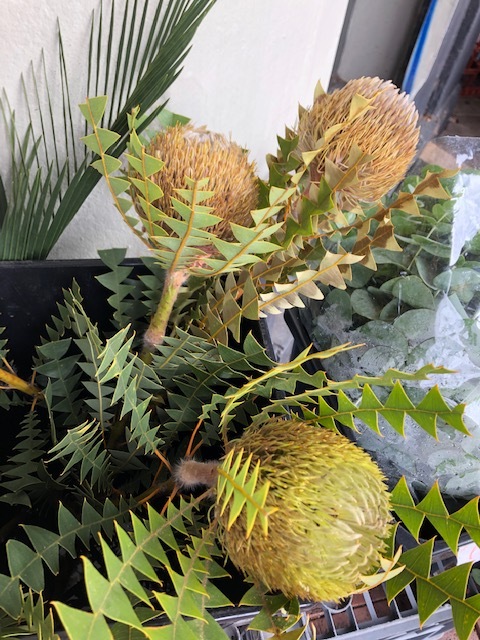 These are banksia baxteri, or ‘birds’ nest baxteri,’ and are native to Western Australia. Outings the past three days have been kept to a minimum – a short walk through our somewhat posh neighborhood (according to Brett’s friend Dave) to a nearby grocery for supplies the first (hot) day; a short walk for Brett over to the train station the next day to see where we need to go on Sunday morning; and a long visit with Brett’s friend from navy days yesterday. Dave married a local girl after a tour here in Australia, and has lived here for 28 years (and yes, he now has a heavy Australian accent). He and Brett had fun catching up and sharing memories. In between all this excitement we’ve been slowly getting our stuff moved around between suitcases so that we’re ready to check in for our train journey early Sunday morning. Dave worked for Brett back in the late 80s when they were both stationed in Key West, Florida. Dave now works for the post office in Perth. They had a lot of fun catching up! Today we finally got out to visit some of the city, taking the OH HEY WA walking tour. We usually prefer to do free walking tours, but this tour got such fabulous reviews that we decided to splurge a little bit and give it a try since we we’re not doing much else here or eating out. The tour was flat-out FABULOUS, and the best walking tour I’ve ever done. 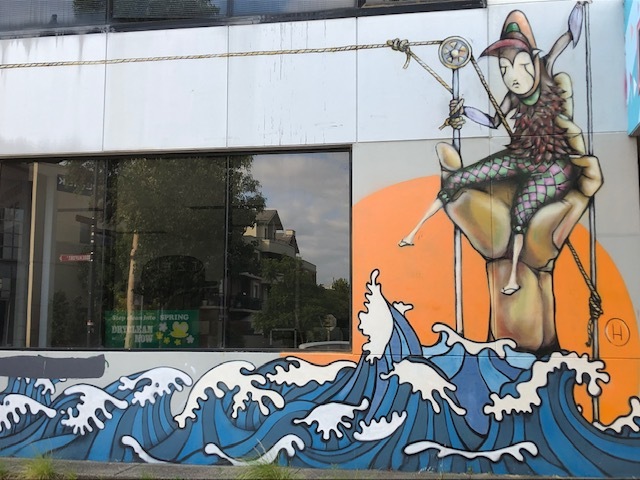 The tour ran the gamut from historical to modern, included more beautiful and thought-provoking street art than we ever imagined, and we also learned lots about Perth’s dining and bar scene. One bar intrigued us so much that Brett and I went back after the tour was over: The Flour Factory, an actual former flour factory (!) that has been converted into a gin bar. 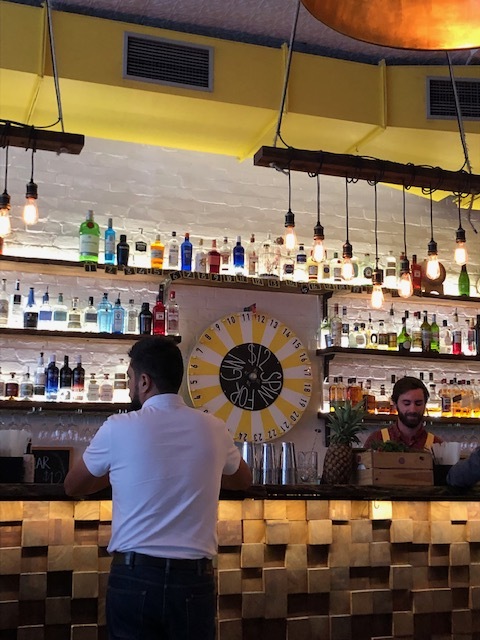 Since we both love gin and tonics we decided to spin the bar’s “gin wheel,” and each of us had a speciality drink made with a different gin, sourced from different places around the world. It was very refreshing and a great way to end the day. The “gin wheel” at The Flour Factory. Tomorrow is Australia Day, the official national holiday, so everywhere is going to be crowded, especially in the afternoon. We’re going to head into town in the morning to Elizabeth Quay, and from there take the bus down to see the famous Blue Boat House (officially the Crawley Edge Boatshed), and also check out the Eliza statue before heading back to Elizabeth Quay to take a leisurely gondola ride at noon out on the Swan River, another low-cost outing that gets rave reviews. It will give us chance to see some more of the city from the water. According to Brett’s friend Dave, if we go before noon we should miss most of the crowds, but the temperatures are expected to start climbing again tomorrow too. 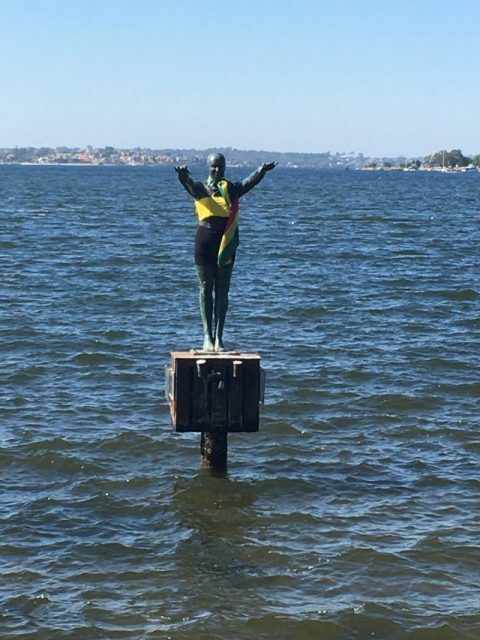 Eliza, by the way, is the statue of a swimmer that sits out in the water, who is always dressed in clothes appropriate to the season and goings on in Perth. No one knows exactly who dresses Eliza, or how. 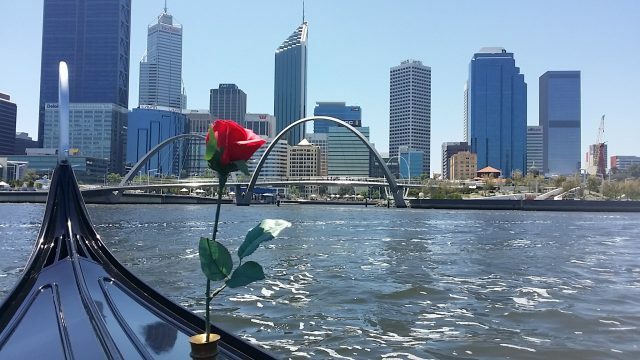 We’re taking a half-hour gondola ride on the Swan River, perfect for enjoying a hot summer’s day (and it will be HOT tomorrow, with temperatures nearing 90 degrees). Perth is the sunniest city in the world. We’re enjoying our Airbnb here except for the mattress. It’s the least comfortable of all the places we’ve stayed, and I wake up almost every morning with a backache. But otherwise the place is very comfortable and well-equipped, and the neighborhood very nice. We’re also getting the best of Perth summer weather: skies are clear blue, and temperatures have been around 80° with lovely breezes. Apparently the weekend before we arrived temperatures soared to over 100° and everyone was pretty much miserable, and it’s supposed to start going up again tomorrow and be miserable again on Sunday, right as we leave. We actually wish though that we could stay in Perth a bit longer, but our train journey across Australia awaits! I can totally relate to the need to relax before beginning again. I got home from LA last night, and leave for London on Saturday (next week). I’m completely exhausted & burned out & only have my eye on the prize of making it through this next trip before I can really relax. I need more sleep! Perth looks so lovely & I’m happy that you have this break time before you move on to your next adventure! Someone commented on Instagram the other day that we were like the Energizer Bunnies. No way – if we had been traveling like we did through India and Hong Kong we would have quit a long time ago – it was a real wake-up call for us. Traveling slow, and taking time off when we need it is what has made a difference and what allows us to keep going. 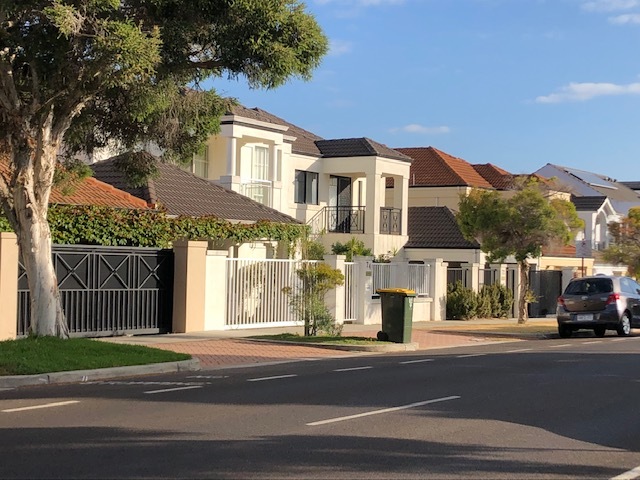 We have greatly enjoyed our time in Perth and are glad we came – it’s a beautiful and fun city! I am so glad you posted about Perth. Most of us are familiar with Sydney and the Opera House, or the Great Barrier Reef, but Perth is a big unknown. It appears to be both beautiful and fascinating. The picture of Brett and Dave is so interesting, too, because it shows what a small world this really is. Key West and Perth are 11,000 miles apart. Yet, two old friends meet up and share like it was yesterday and no big deal to be half a world away from where they last met. 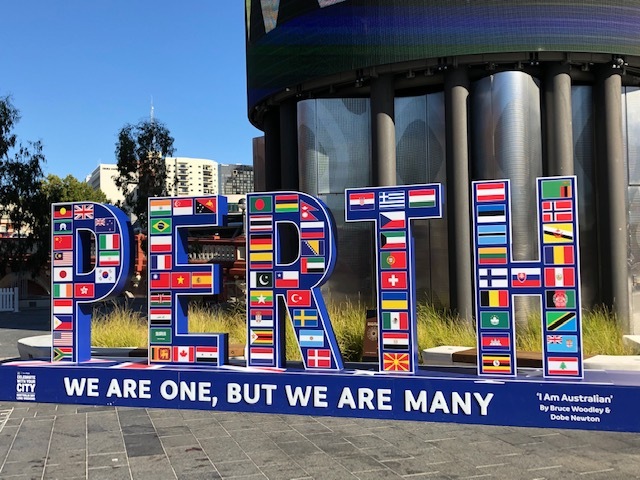 The word is getting out about Perth – apparently it’s on several “must see” city lists this year. The biggest issues for U.S. residents is that it’s just so darn far away! That’s probably the biggest reason that we won’t make it back here (but never say never), so I’m very glad we came this time. It’s a great city, and there’s far more to see and do here and nearby that we just didn’t have the time to do. It was so much fun watching Dave and Brett sit and reminisce, like no time had passed at all. It was amazing the number of names, incidents, etc. they remembered from so many years ago, like it had all happened yesterday. They really had a great time together and we’re so glad we could make it happen. Dave occasionally gets back to the U.S. so hopefully there’ll be another chance for them to reconnect some day. People who were in the military seem to be better at keeping in touch and picking up where they left off no matter how much time has gone by than the rest of us. I have a friend who was in the navy for 20 years and he keeps in touch with everyone he ever met all over the world! I’m always amazed by it. Whenever he’s away somewhere he’ll find someone he knew and visit them and they do the same when they’re in his area. We have several friends that we have known for nearly 30 years that we met when Brett was in the navy, and several others that we keep in touch with. It really is like being in a very special club when you serve together with someone, and special connections are made that last a lifetime. It was really fun for me to watch Brett and Dave reconnect after so many years, especially how many names they still remembered. I’ve heard of Perth but never seen any pictures. Yours are great as always. I wonder why Americans always seem to pick up the accent of the place they are living. I didn’t have one until Daddy retired and we moved to Florida. A two week trip to England and I was already picking up some of the guides British accent. I haven’t noticed foreigners picking up an American accent even after they have been here for years. Brett’s ship stopped a couple of times in Perth when we were stationed in Japan, and it made sense as well to start the train journey from here versus going the other way. I’m really glad we came – it’s been a great visit although I wish we had the time to do and see more. Accents are funny things. We don’t notice foreigners picking up American accents, but back in their home countries they sure can hear the difference! My daughters all speak Chinese fluently, but have been told many times they speak with an American accent, but Brett and I don’t hear it – they sound like native speakers to us. 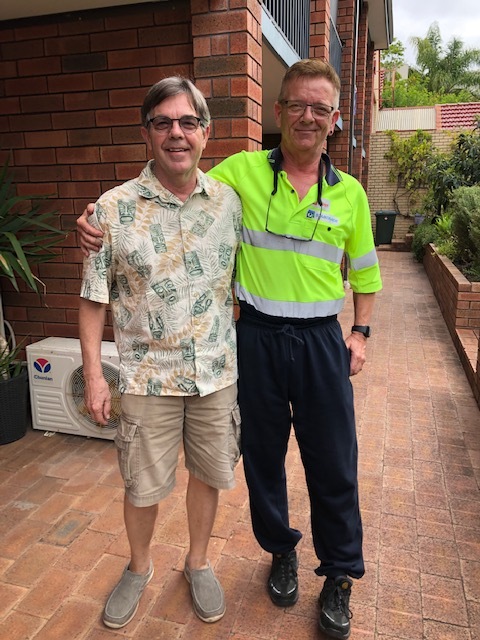 Brett’s friend had a heavy Australian accent when he arrived to visit but by the time he left here it had completely disappeared – you’d never have known he’d lived in Australia for 30 years. I am so enjoying “traveling” along with you! And I agree re slow travel versus moving often. I’m a couple of years out from retirement still but when I do retire I hope to do longer trips and not move around too much. Unfortunately, my hubs is not a big traveler so I’m going to have to figure out the solo travel thing! Thanks, Tracy! Slow-traveling has really been the way to go for us, being able to unpack a bit and not have to continually dig things out of a suitcase, or get one ready to go – I think that’s why the India trip was a bit more exhausting for us: we were moving around so much every couple of days. There is lots of information out there for solo travelers, but if it’s not about the actual “getting there” part of travel, maybe your husband might like traveling more if you picked one spot and stayed there? I hope so! Looks like a lovely city to visit. And I love the accent story. My mom is Finnish and when she talks to her sisters she has a real accent that disappears when she hangs up the phone. My DH tells me I got back into my “home” accent when I talk to her, but I don’t hear it. haha. 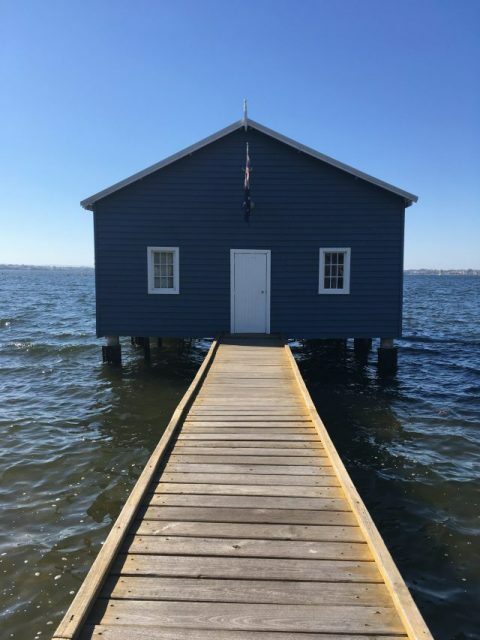 We loved Perth – so much going on and so much wonderful art. Just wish it wasn’t so darn far away! I have a good “accent” story in my post about our train trip – it was a real wake-up call for me! I never knew that you lived in Key West during the 80’s. I lived there from 1975 through the late 80’s. Small world. Everything is so different now – the commissary has been moved to Sigsbee (now called Dredger’s Key or something like that), and half he housing removed to put in RV pads and other recreation activities for active duty and retirees. Sigsbee Elementary is now a charter school!